To strengthen the capacity of common people at the community level to handle conflict in nonviolent ways, bringing change in their lives through the tools of mobilization and advocacy leading to sustainable peace. 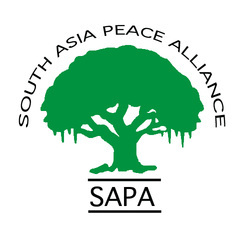 The South Asia Peace Alliance (SAPA) is a peace network, which works in the South Asian region to promote peace through nonviolent action. It has its Core Group organizations in India, Pakistan, Sri Lanka, Nepal, Bangladesh and Afghanistan. SAPA’s member organizations aim to promote sustainable peace through the philosophy and practice of Ahimsa (nonviolence) by addressing structural and other forms of violence that affects a large number of marginalized people across the region. Join Us on Facebook-Sapa Allianceforpeace.